Stop looking in the rearview mirror! 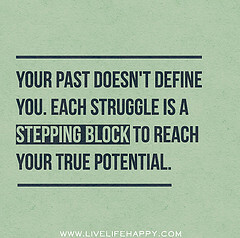 There is a tendency to dwell on your past accomplishments! It is when we cling to the past that hurts you! Everyone knows of someone who peaked too quickly. For example, the high school football star, perhaps the valedictorian or homecoming king or queen. They were most popular or the smartest kids in school, but never did anything again. I am sure you have heard the quote, “life is a marathon, not a sprint.” (Phillip C. McGraw) One of my favorite movies is Citizen Kane. It was a film co-written, directed, produced and starring Orson Welles. It is considered one of the best movies ever made. It followed his early success with the Mercury Theatre broadcast of The War of the Worlds (1938). He was just twenty-one (21) years old when he achieved this prominence. He never achieved this kind of success again! In music, there are music performers who have just one hit. They call them one hit wonders! A one hit wonder is a person or act known mainly for only a single success. Although often used to describe musicians, it can describe a variety of businesses, individuals or situations. J.D. Salinger, author of The Catcher in the Rye may qualify. There are companies who have one major product and never achieve similar success. This occurs with movies often which are why we do not understand their accounting. Can a company survive on just one hit? Yes, particularly if they have a lot of patents. You can keep your lock on the industry for quite a long time, but eventually, you have to reinvent yourself by adding more products or services. I think this is true for individuals too. I am sure you know someone who is really good in school, sports or work; you cannot rest on your past accomplishments. When I owned my restaurant, every day was you started over. It did not matter that you had a record sales day yesterday. If a customer had a bad experience today, they may not return! The restaurant business is a tough business, but that is why you can do well too. I had to constantly find ways to promote my business. If you think this phenomenon ‎ is only associated with restaurants you are missing the point. This happens in stock market too. In fact, one of the disclaimers you can find regarding mutual funds is “past performance does not guarantee future results.” We all read that disclaimer, but evaluate the stock or mutual fund based on a variety of criteria. Bottom line, we all have successes and failures because we are doing a variety of things. If you do not make mistakes, you are not doing anything! For some people, success may be only once, but that is because they stopped working toward success. At one time or another, we all take a break. I know I did and did not set goals and I started floating aimlessly and resting on my past accomplishments. It is as dangerous as constant failure. Failure can stop you from trying too. Success usually motivates more success, but not always. Things happen and you can keep trying, but still fail. We may not compete in sports or become CEO, but you can live a successful life. You can live (consumer) debt free and put away money for retirement. You can pursue a career or start a business and follow your passion. You can learn about investing and have enough to retire early. It is up to you! You do not want to look in the mirror late in life and have regrets! “Life is a marathon, not a sprint.” Life requires planning, strategy and hard work. As I get (er), I start to realize that life is finite and you want to do as much as you can every day/week/year, but it is not quite that simple. It is the reason; I follow the multiple income strategy. After all stuff happens and you need a backup plan or plan B! Success is not just accomplishing one goal, but many goals. It is not reserved to your career or personal life either. “Stop looking in the rearview mirror and start concentrating on the road ahead, because you may be missing all the signs that lead you in the right direction.” (Unknown) Do you have a five or ten year plan? Where do you want to be when you are in your forties, fifties and sixties? I have plans for retirement. I have no intention of just kicking back and doing nothing. I need to look forward to doing something everyday! Stop looking in the rearview mirror because there is a lot to look forward to! Thanks for the advice. I’m still working on my small business and although I’m not in the restaurant business, I still feel the pressure to constantly market the business and to perform. It’s a matter of survival. It’s one reason why I’m also looking to diversify my income streams through real estate, online, etc. Retirement is something I think about a lot and have finally started to take steps in preparing for. planning your future is as important as doing the here and now. Small business is the start of working on your future. Good luck. Very good advice. Do not dwell on past accomplishments and failures. It is imperative that you take what you have learned from those and apply them to the process on the road to reaching your next goal. Enjoy the victories in life and in you career but developing new goals and objectives will keep you hungry in life. I am always looking forward, setting goals and making plans. I learn from my mistkes and keep going.